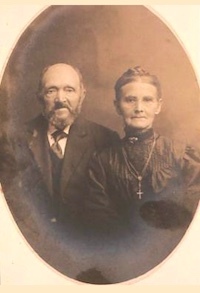 My great great grandparents, August and Christina Beine, came to America in 1880 with seven of their eight children. They had one more child, William, after they settled in Missouri. Their oldest child, named August after his father, is my great grandfather. Their second oldest child, named Christina after her mother, was left behind in Germany. She was eleven years old. She was apparently betrothed to someone, and I'm assuming she lived with relatives, possibly one of her father's siblings, until she married. Christina celebrated her 12th birthday in Germany a month after the rest of her family arrived by ship in Philadelphia. August Beine, my great great grandfather, was born in a German village called Grosseneder in 1839. At some point he moved to Katernberg, a suburb of Essen, Germany, where he became a coal miner. 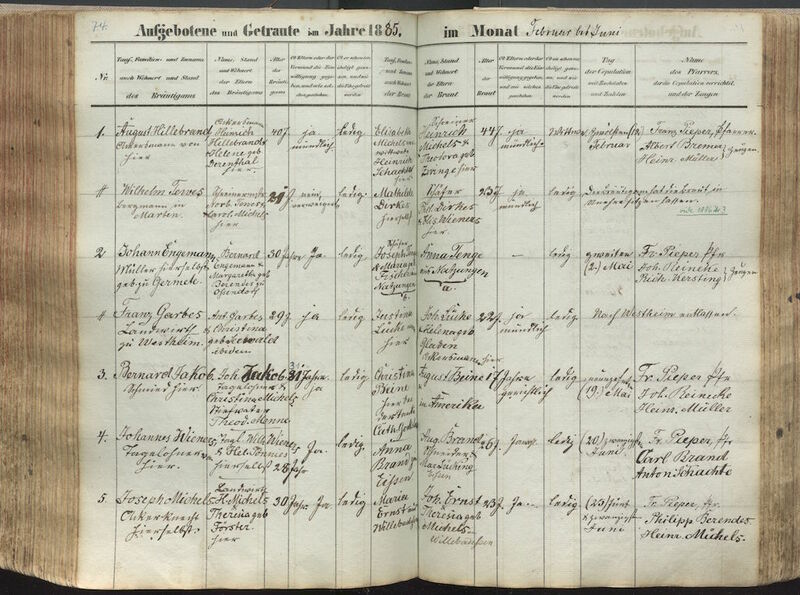 In 1865 he married my great great grandmother, Christina Walter, in nearby Essen-Stoppenberg. Christina was born in 1840 in Siddinghausen, a village about 60 kilometers from Grosseneder. For a long time I didn't know much about Christina, the girl they left behind. But I did know she died before her father because August Beine's will from 1911 refers to her as "Christina Jakob deceased daughter." Her share of the Beine estate went to her children, who are named in the later probate record. 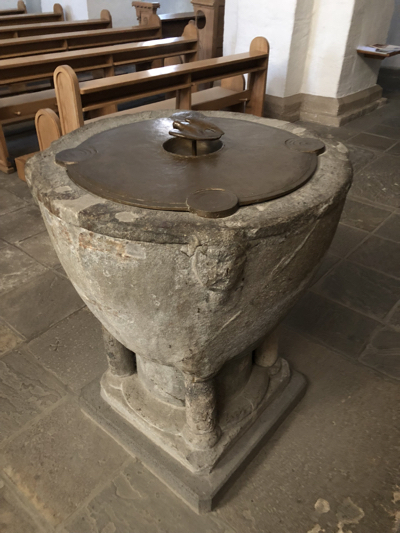 In 2010 I contacted the pastor of the St. Nikolaus parish in Stoppenberg, where Christina was baptized, and asked if he could find a marriage record for her. But he was unable to find anything. At that point I assumed I might never know more about Christina. Then on the day after Christmas in 2016, I received a fascinating email from a man in Germany named Peter Wieners, who told me he was descended from the girl they left behind. Peter had seen an online article I wrote in 2010 celebrating the 130th anniversary of my Beine immigrant family arriving in the USA. He later sent me all sorts of information about Christina, including a photograph of her and her husband with their two oldest children. 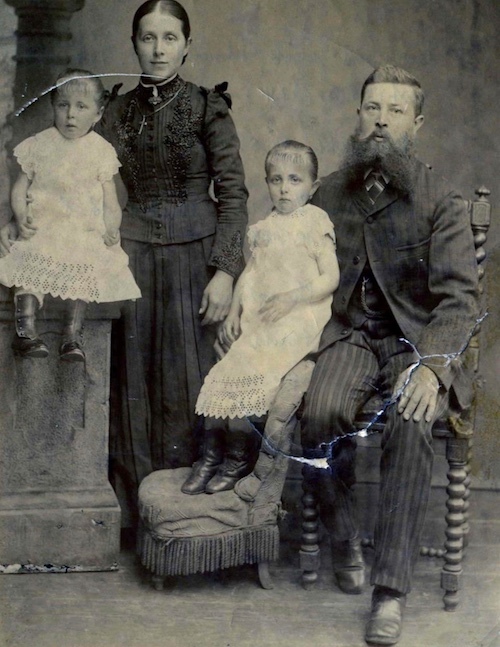 Christina (Beine) and Bernhard Jakob with their two oldest children, Pauline and Christine, circa 1889. Christina married Bernhard Jakob in 1885 when she was 16 and he was 31. The marriage took place in the village of Grosseneder where Christina's father was born. She had six children and four of them died young. Two of her sons, Klemens and Johannes, served in World War I. Klemens died in 1915 while fighting on the Eastern Front. He was officially listed as missing in action. Johannes survived the war and died in 1964. Christina's oldest daughter and namesake, Christine Jakob (1887-1967), married a man named Friedrich Wieners. They had one daughter, Josefa. Friedrich died in 1915 while fighting French and British forces in France during the war. His daughter was born two months after he died. In 1919, Friedrich's widow, Christine, married Friedrich's cousin, August. Peter Wieners, who sent me the email on the day after Christmas, is their grandson. 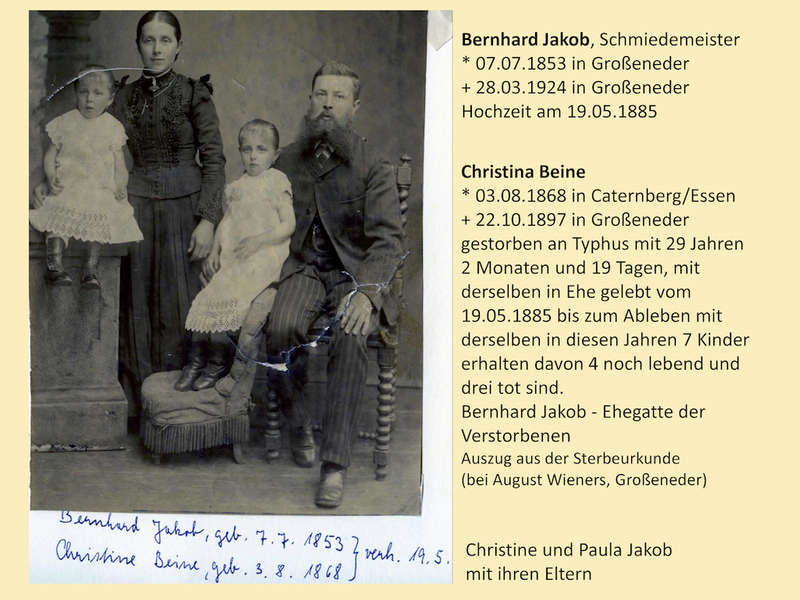 Christina (Beine) Jakob, the girl they left behind, died in Grosseneder at the age of 29, three weeks after giving birth to Johannes. She is my great great aunt. Her husband died in 1924 at the age of 70. Two of my great uncles, Ollie and Frank Beine (brothers of my grandfather August), fought for America in World War I. Two of their first cousins, Klemens and Johannes Jakob, fought for the other side. Sometimes we only have fragments of a person's life, a few old handwritten records, maybe some letters and photographs. It's especially difficult to put the fragments together into something that might resemble what the person was like, and how they lived, and what they thought, if we didn't know them or they lived before us. But we still put the fragments together and try to imagine what the world must have been like for them. And we have questions. What did Christina think when she turned twelve, knowing her parents and siblings were in America beginning new lives without her? How did her mother feel about leaving her young daughter behind? And then losing her at the age of 29, after not seeing her for 18 years? Along with a traveling companion, I visited the St. Nikolaus Catholic Church in Essen, Germany in February 2018. The church was built in 1907. Its twin spires overlook a tram line and the Stoppenberg neighborhood. Just up the road is the coal mine in Katernberg where my great great grandfather worked. It is now a UNESCO world heritage site called the Zollverein Coal Mine Industrial Complex, and no longer a working mine. 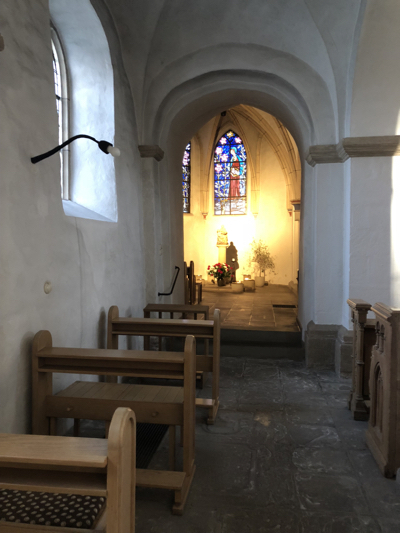 Up on a hill called Kapitelberg, 100 meters behind the St. Nikolaus Church, is a smaller church called Maria in der Not (Mary in Need) that is currently part of a small Carmelite Monastery. It was built a thousand years ago and still stands, still solid. Inside, it is serene and a little mysterious. This is where my great great grandparents, August and Christina, were married, and where their eight German-born children were baptized. They lived somewhere nearby. I even know the house number, Stoppenberg No. 86/2, but the old numbers don't correspond to modern street addresses. And the city was devastated from heavy bombing in World War II. The nearby houses looked maybe fifty years old. 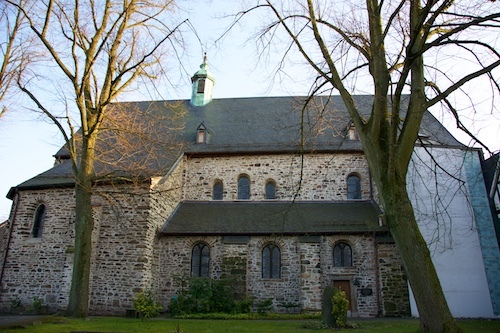 Due to dwindling attendance, the 110-year-old St. Nikolaus church will close in 2020. A group of Iraqi Chaldean Catholics will begin using it, so the church will continue as a place of worship. The thousand-year-old church on the hill behind it will remain with the Carmelites. The kind parish priest, Father Linden, told us that we were probably the first Americans to visit this place. It's not exactly a tourist attraction. A pair of humble yet beautiful Catholic churches in a humble neighborhood in a medium sized German city. But for me this was sacred ground. This was where my ancestors worshipped and lived. And where they made the decision to come to America. And leave a child behind. This article is dedicated to Peter Wieners (1947-2017) and his great grandmother, Christina Beine (1868-1897). Thanks to Peter's wife, Beate. Joe Beine likes to take pictures, write stories, and search for his ancestors. He especially enjoys solving the little mysteries that always seem to show up in his family tree. He lives in Denver with with his perpetual puppy, Raven. Visit Swan Light Stories to read two of his stories and learn more about his novella Exchanging Van Goghs. What an incredible story about an incredible child left behind. I was sad reading it until I read that you connected with Peter - a descendent. So inspiring. I love your family story. Part of mine is also German.I did visit Germany where they came from though. A very long story also. This was such an interesting story! Thanks for sharing. Very thought-provoking and evocative story. I was moved by it. How wonderful that you were able to locate the daughter and then connect with her descendant. Much effort and a bit of luck did the trick. Thank you for posting. Reading this encourages me to continue to track some of my ancestors in Germany. This is a marvelous story! The girl who was left behind could have been just another brick wall but now you know the rest of the story. Nad you visited Germany! The is the kind of story that many of us dream about telling. jostled for me and hope of connecting further. What a lovely story about your ancestors, and particularly the girl they left behind. Do you have any idea why she didn't come with them to America? Was she indentured to help them attain passage? I live in Denver as well, and work on genealogy almost every day. I often think about the ancestors and their siblings and families. The records are basic facts, but they are interesting. I wonder about what happened to the father of the illegitimate child. Ten percent of children born in the 1800s in the now Czech Republic, were born without a father on record. I reread the story and now see she was betrothed, at the age of 11. That means her parents arranged her marriage, now kind of a foreign concept to us, but not uncommon in Europe back then. What a remarkable piece of family history you were able to record about your family. AND this is why many of is search for years and years to bring those names on that piece of paper to life again. They will forever be apart of who we are, and will always be. Thanks for sharing your story. Very heart warming. Thank you so much for sharing. My grandparents came to Canada with their 1 year old son (my father) in 1908. They left behind a daughter who was under three months old when they left. My grandfather had a cousin in Canada who said come and get a homestead for free. Prove it and after three years you can sell it and never have to work again. Unfortunately, they never realized this dream. They never made it back for the daughter. As an adult she wrote many pleading letters to send her money to join them. There was no money to be had. Eventually, my aunt made it to Canada on her own. She was 40 years old. As we travelled together to my grandmother's (her mother's) funeral, my aunt expressed her bitterness. She said what mother does that! I told her the story of how they were going to go back to Austria in 3 years. It helped her deal with it a bit better. My grandmother also left behind her daughter born out of wedlock and fathered by a man who was not my grandfather. She had one son and this son was close to the baby girl my grandparents left behind. My grandmother also spoke of the pain of losing three twins as babies - one was my father's twin. Life was hard but my grandmother was stoic. She told no one else these stories but when I went to the Old Country to visit, I found out they were true.